Since we’re about to move into a space significantly larger than our current one, my wife and I have been busy shopping for a few essential pieces of furniture for our new place. This has essentially worked out to her researching and asking my opinion, then going out to look at things we agree on in person. I know I can be a bit frustrating because I have no pre-determined idea of what I’m looking for in a couch or a table, for instance – I just know if I like something when I see it. Where my wife’s style is probably best described as Modern Eclectic (she tells me), I have no preference and I know that more often than not my contribution is more to nix ideas than propose my own. This past weekend, after signing papers finalizing our mortgage, she braved the holiday crowds to look for furniture again before meeting up with a few of her girlfriends while I had lunch with a couple of my buddies. To her credit, she kept me in the loop as she hunted for side tables. 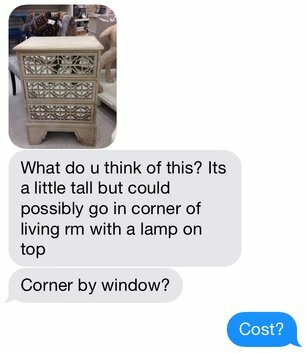 Sadly, the search continues for side tables and next week we’re going in person to look at some light fixtures. And while it’s not my first choice for spending an afternoon, I’m glad she includes me in the decision-making process, even after conversations like this. Guys and gals, feel free to weigh in with your “taste” in furniture or stories of shopping for them with your significant other.